Our Outback came with just one air conditioner which thankfully is at least a decent 15,000 BTU Coleman Mach II. 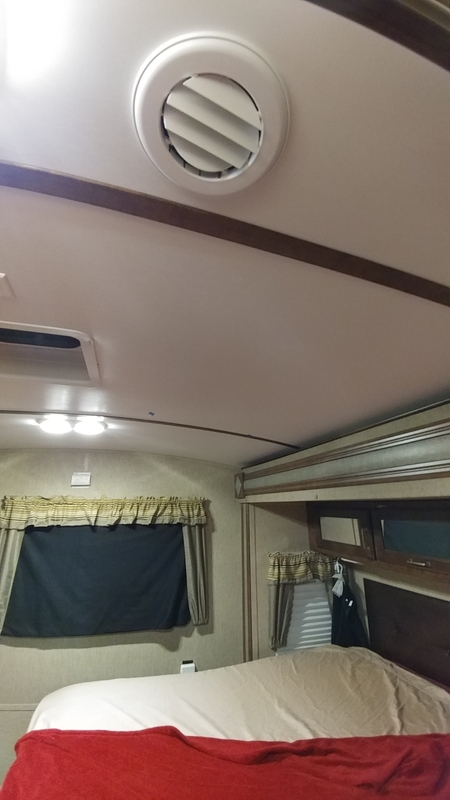 The RV is stubbed (electrical and non-ducted) for an additional AC in the master suite which will make it a lot easier to install one… but we still need to buy and install one. Hhhmph! We purchased the Outback just before Summer officially began and we were expecting the upgraded 15k AC would cool much better than our older 13k on the Cougar, we couldn’t wait to try it out. I mean, it’s like 2K more awesome, right! As the day progresses we realize I’ve suffered long enough and take a look at the temperature inside… seventy-seven degrees?! ZOMG, no wonder why I’m dying! Now the AC is running and I’m internally cooling myself down with a bowl half gallon of ice cream. After a long while we realize that the AC just can’t keep up. It ended up running constantly until 2am just to reach a comfy 72 degrees. But hey, it didn’t burn up! I’ll skip the theatrics and get down to it. I found out that Keystone probably used the cheapest vents around in the ceiling. And the bigger problem is that when it was time to take a nap in the master suite we didn’t stay long because the AC that flows out of that one single vent could barely blow a leaf over much less cool down a room and two people. It was then that we also realized that “Ultra-Lite” also means ultra-less-thermal protection. Again, I return to my old pal the interwebs and decided to upgrade the vents with ones that can close, pivot, and turn (oooh fancy) so when it’s time to nap again, we can close the other vents in the main area for a few hours to strengthen the AC delivery into the master suite. Obviously having a 2nd AC would solve this, too. Upon receiving the new vents I went straight away to install them. That’s when I discovered the sorry attempt at workmanship when the RV was at the factory, I’m shocked. They hadn’t properly sealed the 2″ attic space between the ceiling and the roof, so much of our cooling was actually going straight out. So I bought some HVAC tape (Nashua Aluminum Waterproofing Repair Foil Tape, 11 mil Thick, 10 m Length, 48 mm Width) and so began my next project of sealing up the supplies, vents, and even inside the AC mounting since it was leaking too! This is above the galley and I’m facing the kitchen sink here. I removed the AC shroud and immediately checked the bolts that are holding down our only AC. I got between 4-6 full turns on these studs and there’s only 4 of them! That big thing in the middle is an air-dam that separates the supply and return sides. The left side draws air in over the condenser coils on the roof and the right side blows the now chilled air back out. At the bottom on the right side is the supply duct for the garage and front doorway vent, and opposite that is the supply duct for the rest of the RV’s vents. All of these pics are after I sealed everything up with the foil tape. I used nearly half a roll for the entire job. I’m now facing the front towards the TV. Those front studs were the loosest. Scary. Again, all taped up nicely by me. I’m facing the couch now. 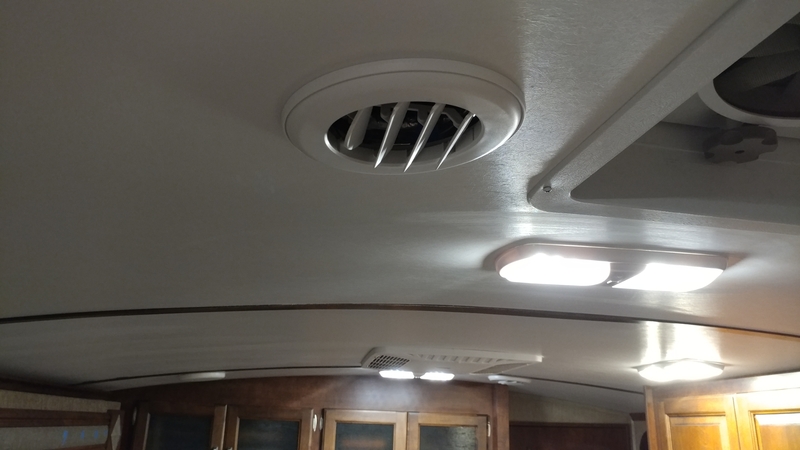 The supply duct for the rest of the RV can be seen on the lower left. Same orientation but now you can see the top of the air dam. When I inspected it the dam wasn’t sealed at all at the top. It was letting the cold and warm side mix. Grrrr. As you can see I taped it up real good also. I removed all the tape that had been installed by Keystone and reapplied it with mine. The original tape was super thin and had holes all over with some areas I could put my pinky through. It’s obvious here that they use a hole-saw with a center drill bit. At every duct penetration is a smaller hole in the duct supply above. I taped those up, too. This is me standing at the (one single) duct in the master suite. I poked my phone’s camera up there and was curious how far it went back. It turns out that it goes all the way to the end, about 8′. So, in the future I may put a 2nd vent in the bedroom, right over my side! But, there’s another potential problem. I’m cooling dead air space for no reason and I have no assurance without cutting into the ceiling that the tape foil at the other end is doing it’s job. Judging from what I’ve seen so far, I’m going to assume, no. I happen to have some left over closed-cell foam and cut it with the wife’s electric turkey carving knife. Shhhh, those double opposing blades are very similar to what pro’s use! This is brilliance in action! The foam is left over Tempurpedic from another project and expands to fill all the crevices. It doesn’t have to look pretty, but this still bothered my OCD a bit. It used to be that I was the only one who knew! The air actually blows forcefully now as well. Here’s the finished vent cover. It rotates very smoothly and being able to open and close them is really nice (like shutting off the garage vent used only for storage). Honestly something that should’ve been stock in my opinion. 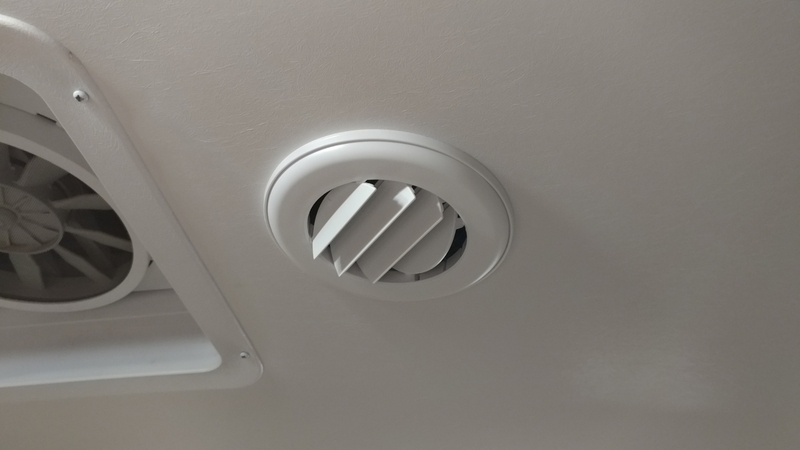 The air is noticeably cooler and the airflow is much stronger even with all vents open! Very cool! Sad you had to put so much work into a new unit. I’m looking at getting into a 324CG and as an industrial HVAC engineer I can only imagine what my tinkering will turn in to the first time the AC (or furnace) turns on. Thanks for the detailed breakdown! Hope you enjoy the rest of the blog, and if you have suggestions please let me know!